"Belonging to the class of Magellanic type irregular galaxy, NGC 4449 is a small but lovely cosmic denizen of the constellation Canes Venatici. It is very close (in astronomical terms) at 12.5 million light years. Blazing across its structure is a starburst of young blue stars and active red nebulae forming new stars at a (fast) and furious pace! Detailed analysis of the starburst has determined that it started 500 million years ago. For many years, it was hypothesized that the starburst observed in NGC 4449 was triggered by an interaction with another galaxy. Enter astronomer extraordinaire David Martinez-Delgado and his pro-am collaboration project to document tidal streams in nearby galaxies. His tidal stream survey has uncovered previously unknown tidal streams in many galaxies. Utilizing a group of amateur astrophotographers led by Jay GaBany with a worldwide network of telescopes and remote observatories, it has been possible to obtain very long exposures that would not normally be possible with professional observatories due to limitations imposed by time allocation constraints. The group of amateur astrophotographers includes many famous people such as Ken Crawford, Adam Block, Fabian Neyer, a certain Mark Hanson and many others. Deep images taken by the tidal stream survey group uncovered an extremely faint tidal stream, which is the remnant of a former dwarf companion. Special image processing techniques combined with very long exposures are able to reveal very faint features that would not normally be visible. This stream can be seen as the ghostly elongated tidal feature to the south of NGC 4449. It was first discovered in 2007 by Igor Karachentsev and followed up for a definitive detection by the tidal stream survey team. The stream has a size of approximately 23,000 x 5000 light years. The accretion of smaller galaxies is a major contributing factor to galaxy assembly and is a major topic of research in astrophysics. Revealing the dim past of galaxies can help gain insight to their future and address related topics such as dark matter distribution." I like the fact that you bring out the faint old reddish disk surrounding the fire of blue and pink star formation along a bar-like structure in NGC 4449. Oh, and I like the fact that y ou bring out the very, very faint companion too. Since the companion is composed of old red and yellow stars only (plus, we may assume, dark matter), it is probably heftier than it looks. IC 1805, an emission nebula approximately 7,500 light years from Earth in the constellation Cassiopeia, is named the Heart Nebula due to its heart shaped appearance. The open star cluster Melotte 15 lies in the middle of the heart. The nebula is part of a large star forming complex in the Perseus arm of the Milky Way galaxy. The bright knot at the lower right (which some might liken to a male body part) is separately classified as NGC 896, and was the first part of IC 1805 to be discovered. Comprising mostly glowing hydrogen, this nebula would appear red if imaged in LRGB. We have imaged it using narrowband filters, mapping Sulfur 2, Hydrogen Alpha and Oxygen 3 to R, G and B respectively to reveal great detail in the Hubble palette. 76 individual exposures totalling more than 25 hours were shot from the dark skies of West Virginia. Image processed using PixInsight and Photoshop. 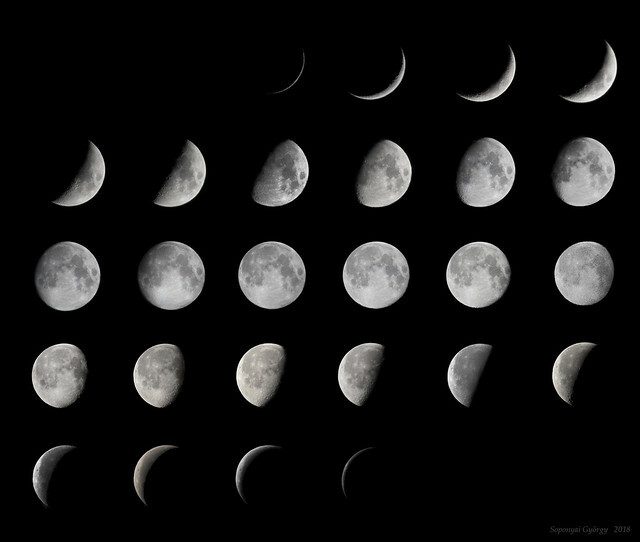 I've been unsuccessfully trying to complete a whole Lunar cycle capturing project for months as bad weather and clouds always made me stop after 5-10 days. Supernova Remnant VRO 42.5.01 in the constellation of auriga. I leave here our last work. A beautiful composition in which Deneb appears as the spectator of this beautiful landscape. Copyrights: Raul Villaverde, Domingo Pestana and Nicolas Romo. 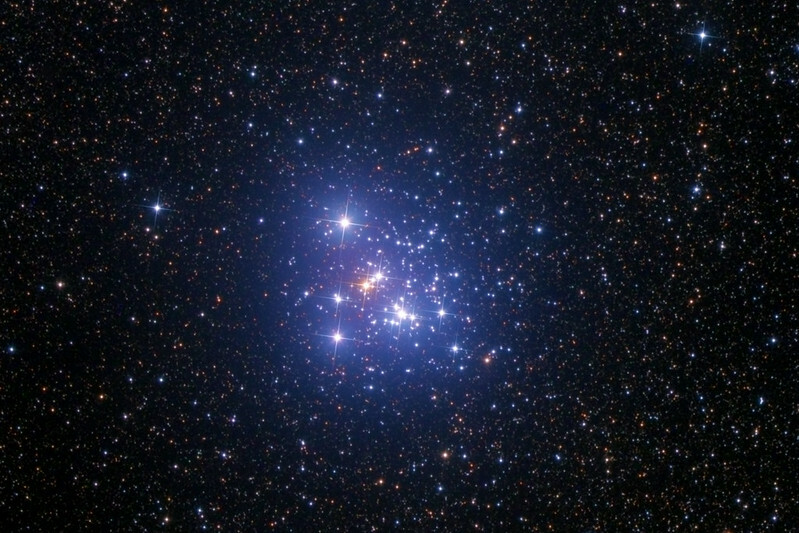 The Jewel Box (NGC 4755, Caldwell 94) is a magnificent open cluster in the southern constellation Crux. To image this object I logged on remotely to iTelescope T31 at the Siding Spring Observatory in New South Wales, Australia. 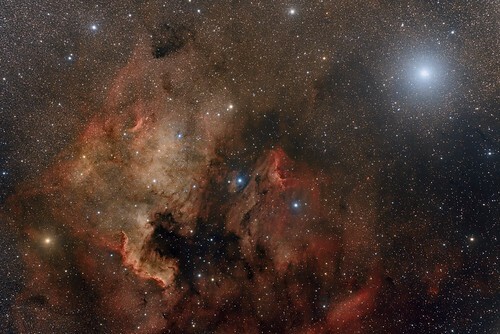 Total imaging time, through LRGB filters, was 18 minutes. NGC 4676, known as the Mice Galaxies, are two spiral galaxies in the constellation Coma Berenices, approximately 290 million light years from Earth. The long tails result from tidal action — the relative difference in gravitation pull on the near (colliding) and far sides of the galaxies. This image was taken with our Officina Stellare RiLA 600 f/5.0 telescope on an Officina Stellare direct drive polar fork mount. An FLI ML16200 CCD camera, chilled to -25C, captured 16-1/2 hours of luminance detail and 9 hours of color detail. The imaging system is controlled using Voyager software. Image processing in PixInsight and Photoshop. M101 Pinwheel Galaxy & Co.
One of my favorite galaxies, which I never tire of revisiting. Authors: Alberto Pisabarro, Jim and Linda Powell. 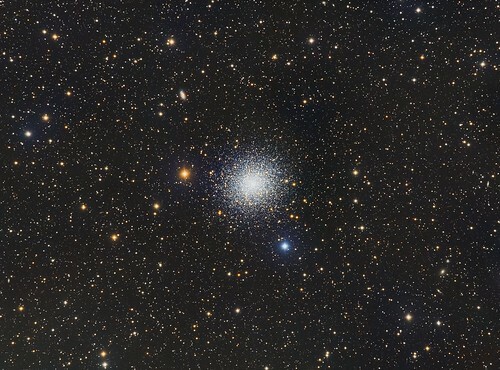 Astrodon 5nm H-Alpha filter: 12x1800"
I would like to bring to your attention the picture below I made a few nights ago from the La Silla Observatory (ESO) in Chile. 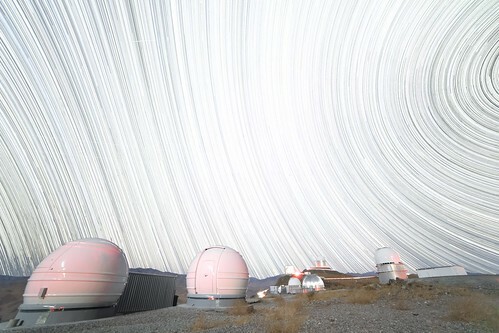 Chile is the home of many astronomical observatories because its sky is among the best one on Earth. 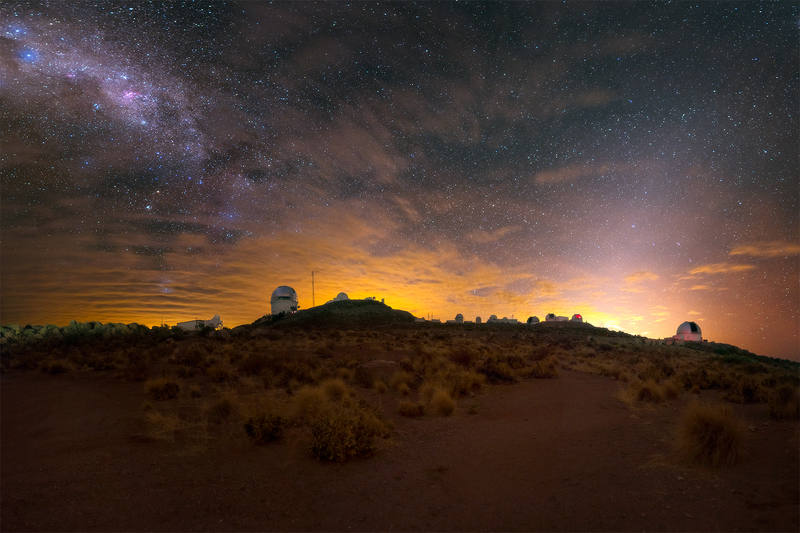 The picture below is a panoramic composition of the whole sky revealing the Milky Way above the ESO-3.6m telescope, hunting for new worlds. 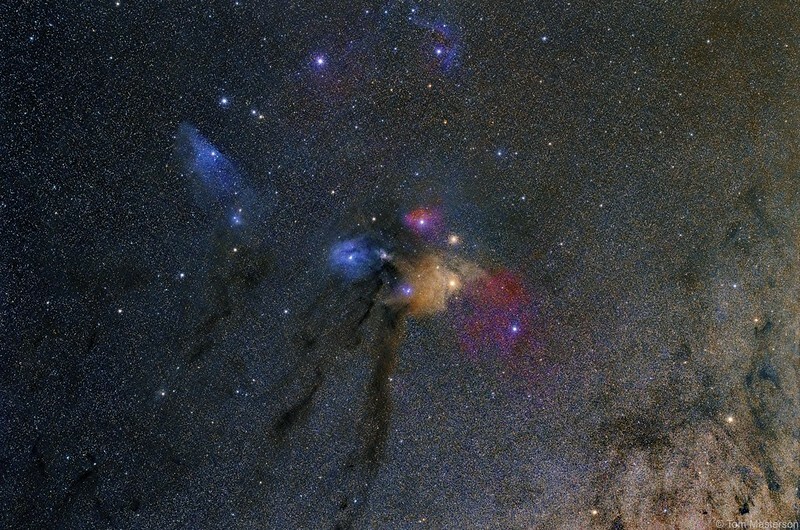 The Magellan clouds can also been seen on the right of the picture. However, what is also pretty clear in this picture is the orange ring circling the southern sky. This light is not an astronomical event nor an atmospheric phenomenon but the Sodium-based street lights of nearby cities. Such light pollution was not visible from La Silla Observatory a few years ago and is the result of the fast economical development of Chile. The night sky is an heritage that we should all protect, not only because it is the playground of astronomers but because it is our window to the Universe. The night sky reminds us every day how modest we are compared to the vastness of space ! If the Chilean sky is getting polluted by this orange layer, we will be just one step before no star is observable on Earth. This would prevent the next generations to see the treasure of the night sky. With this picture, I hope to broadly show that the night sky is a heritage of humankind and should be protected against pollution. I would like to bring to you this other picture I made from the ESO La Silla Observatory in Chile, last night. This picture is a 10-hour star trail composition. If the Universe was static and infinite, there should be an infinite number of stars. As a consequence any line of sight towards the sky should ends on a bright stellar surface. If this was true, the night sky should not be dark, but bright. This is called the Olbers' paradox and was one of the first evidence of a dynamic, not-infinite Universe. However, there are so many stars that can be seen from the ESO La Silla Observatory in Chile that if we stack pictures of the sky over 10 hours, as done in this composition, we have the impression that the night sky is full of stars. While in Chile, we stayed at Cerro Tololo Observatory for a few nights and were able to catch a break in the clouds. 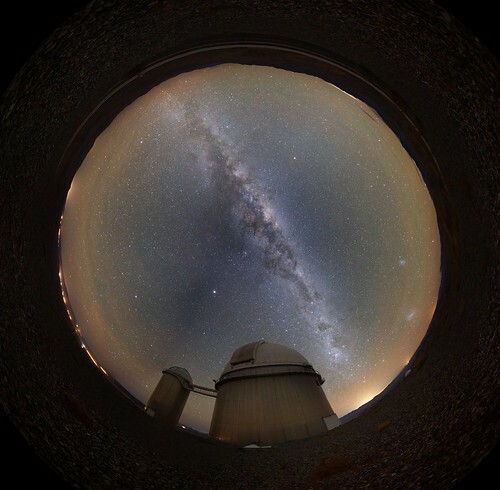 The Milky Way shined bright with the Zodiacal Light over the observatories. This was my first time seeing the Zodiacal Light, which is dust in our solar system being illuminated by the sun. I've been yearning to see this incredible sight of the Zodiacal for a long time! Last edited by bystander on Mon May 21, 2018 2:31 pm, edited 3 times in total. Saturn appears above the bright globular cluster M22. Taken on May 7, 2018, between 1:30 am and 2:00 am with a Canon 40D DSLR through a Tamron 300mm f/2.8 telephoto lens, tracked on a Super Polaris EQ mount. Taken from near Barry's Bay, Ontario, Canada. Exposures: 10 x 91 seconds (15 min 10 secs total) at settings f/2.8 and ISO 1600. This is an image, and reflection, of Jupiter rising in the east over Spectacle Lake, in Ontario, Canada, on May 8, 2018 at 9:17 pm. According to the 2018 RASC Handbook (page 107), Jupiter reached opposition at UT 1 am on May 9, 2018. Taken with a Canon 40D DSLR set at ISO 200 through a 50mm lens set at f/3.5, for a 10-second exposure. The camera was on a fixed tripod. Seyfert's Sextet from KG Observatory, Julian, CA. This object was a challenge at only 2' x 2' and between magnitude 15 and 16. Seyfert's Sextet is a group of galaxies about 190 million light-years away in the constellation Serpens. The group appears to contain six members, but one of the galaxies is a background object and another "galaxy" is actually a separated part of one of the other galaxies. The gravitational interaction among these galaxies should continue for hundreds of millions of years. Ultimately, the galaxies will merge to form a single giant elliptical galaxy. The small S-shaped galaxy, NGC 6027d, is not interacting with the other galaxies in the cluster, but is in the background and just happens to be in the same line of sight. The galaxy is nearly 900 million light years from Earth and is believed to be extremely large in size at magnitude 16.47. This image consists of 4 different images of the sun and 3 planets of the solar system. The photo of the Sun was taken on October 27, 2014 in Algiers with an 8-inch telescope (Celestron C8), a solar filter and a monochrome camera (DMK51). We recognize the very large sunspot AR 2192. The photo of Mars was taken on May 3, 2016 at 1:06 UT in Algiers with an 11-inch telescope (Celeston C11), Barlow x2 lens and a color video camera (ASI120MC). The photo of Jupiter was taken on May 02, 2016 at 22:00 UT in Algiers with an 11-inch telescope (Celeston C11), Barlow x2 lens and a color video camera (ASI120MC). The photo of Saturn was taken on June 14, 2014 at 1:06 UT in Algiers with an 11-inch telescope (Celeston C11), Barlow x2 lens and a color video camera (DFK51). NGC 3628, named the Hamburger Galaxy, is an unbarred spiral galaxy in the constellation Leo, approximately 35 million light years from Earth. Along with Messier galaxies M 65 and M 66, it forms the Leo Triplet, a small galaxy group. It derives its name from its appearance, with a puffy bulging galactic disk obscured by dark dust lanes. The galaxy's tidal tail (upper left) resulting from interaction with another galaxy may be up to 300,000 light years long. Abell 2218, nealy 50 hours of exposure time collected by Mr. Morten la Cour!